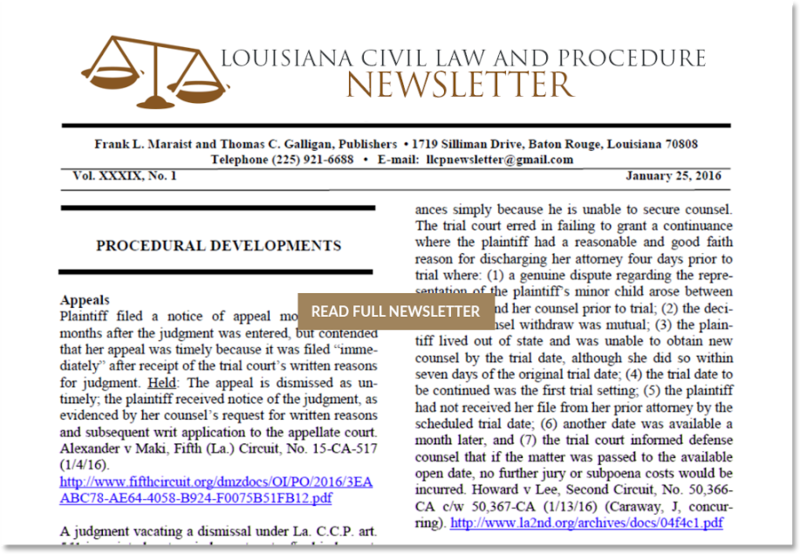 Since 1978, the Louisiana Civil Law and Procedure Newsletter has provided practitioners and scholars of Louisiana law with succinct summaries of recent cases and statutes in all areas of civil law and procedure. The Newsletter focuses on providing just enough information to apprise its readers of cases and developments that may be relevant to their practice areas. A subscription to the Newsletter includes access to the website and past issues of the newsletters (in a searchable format), links to all cases and statutes cited, and a monthly letter emailed to all subscribers. A paper copy of the newsletter is available at an additional cost. For information on pricing and subscriptions to the newsletter, click here. Below are snippts of some of the articles from our latest publications. A party who confessed judgment in a trial court proceedings or who voluntarily and unconditionally acquiesced in a judgment—here a stipulation—may not appeal from that judgment. See La. C.C.P. art. 2085. Cordon v Parish Glass of St. Tammany… book. A judgment that states that it is granting either an exception of prescription or preemption and does not state what claims are dismissed does not contain sufficient decretal language. Holland v Holland, Third Circuit, 16-117 (4/6/16). Click the newsletter below to read a sample of our monthly publication.